Rhombohedral Calcite crystals on a limonite matrix with very well defined faces and edges. 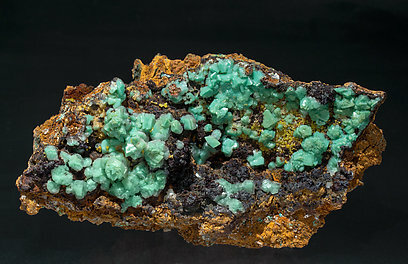 They are very rich in blue inclusions of an undetermined secondary copper mineral. The crystals have been analyzed and, although their aspect suggests it could be another species, it is an unusual Calcite with inclusions. We will send a copy of the analysis to the buyer.